Lisbon is recognised ever since as the city of seven hills,characterised by the existence of very winding and teep streets, which hinder pedestrian movement and mobility. It was with this in mind funiculars lift services were started, consisting today of historical means of transport, classified as National Monuments. Do a tour around Lisbon, visiting its traditional funiculars with magnific views of the city, and surrounding museums. More details can be found here. Dianatours – Viagens e Turismo, Lda. Your guided tour starts in the Belém quarter, where you find the most beautiful and historical monuments from the 15th and 16th centuries. After a brief stop at the Belém Tower a world heritage by UNESCO, you will take a look at the Monument to the Discoveries (Padrão dos Descobrimentos). Next you visit the church of S. Jerome Monastery, the Coach Museum, the oldest and most picturesque district of Lisbon – Alfama and pass by the downtown (Baixa) to admire the most important squares of Lisbon such as the monumental Trade Square and Rossio Square. First of all you visit the impressive and romantic Pena Palace, located on one of the highest peaks in Serra de Sintra Natural Park and built in the 19th century at a high of 500 meters (1640 ft). The palace is characterised by its blend of styles, which combine to create an unmistakable appearance. At the end of the morning, you will drive to Sintra where you have some free time to wander the medieval streets of the town that charmed kings and inspired poets and to taste the traditional sweets of the region. After lunch in Sintra, you drive to Cascais a little fishing harbor which was the former summer residence of the Portuguese Royal Family. Here you can enjoy a magnificent view over the bay. Before returning to Lisbon, you will pass by Estoril where you will see the Casino and its gardens (the bus does not stop, it’s just a panoramic tour). 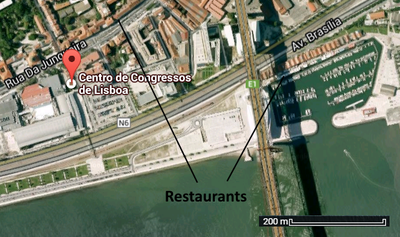 Schedule: daily at 9:00 am, departing from Campo Grande 30B, 1700 Lisboa, Portugal. A similar tour starts at 2:30 pm, which includes a stop at the Cape Roca, the westernmost point in continental Europe and excludes a stop at Pena Palace and a visit to the Sintra National Palace. First of all you visit the impressive and romantic Pena Palace, located on one of the highest peaks in Serra de Sintra Natural Park and built in the 19th century at a high of 500 meters (1640 ft). The palace is characterised by its blend of styles, which combine to create an unmistakable appearance. At the end of the morning, you will drive to Sintra where you have some free time to wander the medieval streets of the town that charmed kings and inspired poets and to taste the traditional sweets of the region. After lunch in Sintra, you drive to Sintra National Palace, the former hunting residence of the Portuguese royal family in the 15th century. After a stop at the Cape Roca – Westernmost point in continental Europe – you continue your tour to Cascais, a little fishing harbor which was the former summer residence of the Portuguese royal family. Here you can enjoy a magnificent view over the bay. 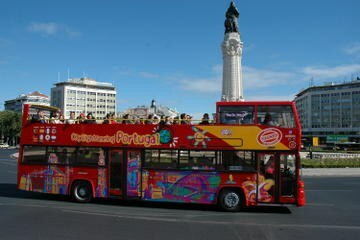 Before your return to Lisbon, you will finally pass by Estoril where you will see the Casino and its gardens (the bus does not stop, it’s just a panoramic tour). This tour includes a lunch. Leaving Lisbon you head north. Your first stop is Óbidos, a small village surrounded by medieval walls, with its typical whitewashed houses and wrought iron balconies, its handcraft and the famous Pousada do Castelo. Your next stop is Nazaré, one of the most picturesque Portuguese fishing villages. Here you will have some free time and you can stroll through the little village. After that you visit the wonderful church of Batalha (World Heritage by UNESCO), a monastery of the 14th century, which is considered a masterpiece of Portuguese gothic architecture with his beautiful stained-glass windows. pilgrimage place, where Our Lady appeared in 1917. Here you have lunch. Before returning to Lisbon, you finally visit the houses of Lúcia, Francisco and Jacinta in Aljustrel. They were children from Aljustrel who said they witnessed three apparitions of an angel in 1916 and several apparitions of the Blessed Virgin Mary in 1917. Mary was given the title Our Lady of Fátima as a result, and Fátima became a major centre of world Christian pilgrimage.after that you also get some free time to visit the Shrine of the Sanctuary, as well as time to attend the mass.